“Right mouse click” the link below (in blue) that says ENewsletterSystemFiles.pdf You’ll see a menu like the one to the right open up. In Internet Explorer choose “Save Target As…” and download the file to your desktop (In some cases it may say “Save Link As..” ). 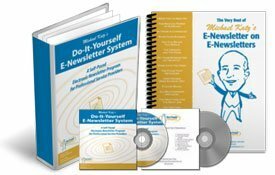 EnewsletterActionPlan.doc: This is a word document containing the editable Action Plan (described within the ENewsletterSystemAndBestOf.pdf document). EmailTrackingSpreadsheet.xls: This is an Excel file that contains a working tracking sheet (described within the ENewsletterSystemAndBestOf.pdf document). “Right mouse click” the link below (in blue) that says QuickStartTeleseminar.mp3You’ll see a menu like the one to the right open up. 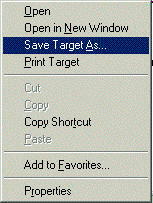 In Internet Explorer choose “Save Target As…” and download the file to your desktop (In some cases it may say “Save Link As..” ). Find the file named QuickStartTeleseminar.mp3 on your desktop and double-click to open and listen.